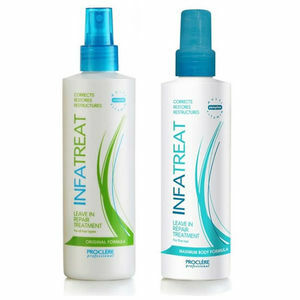 Great value twin pack of leave-in treatments for fine and normal hair. Proclère's Professional Infatreat Original & Maximum Body Twin Pack features two great products designed to maintain the natural balance of moisture and strength within the hair. Perfect as a pre-treatment, the Maximum Body formula gives extra body to fine or limp hair while ensuring optimum condition and shine. The Original formula is an excellent leave-in vitamin complex that focuses on the maintenance of hair's natural balance. Pack contains 2 x 250-ml bottles. £8.63 (inc. VAT) Why no VAT? We're a trade wholesaler and quote our prices without VAT to help our VAT-registered customers understand the true cost of a purchase.